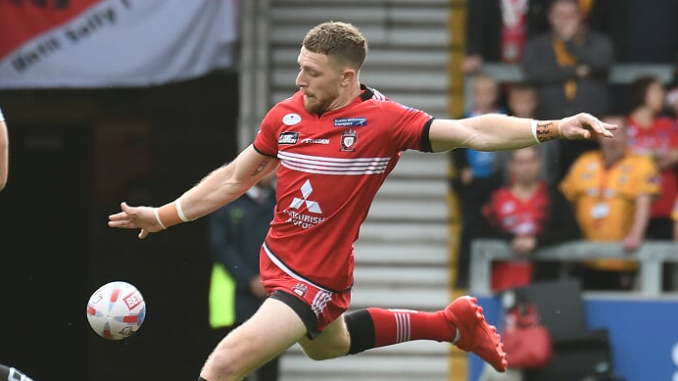 Jackson Hastings has signed a contract extension with Salford for the 2019 season. The 22-year-old joined the Red Devils at the end of July and has had a huge impact on Ian Watson’s side, scoring five tries in The Qualifiers. Hastings was linked with a number of Super League clubs but he has decided to stay at the Red Devils for next year. He said: “In the end it was a pretty easy decision to be honest. “When I laid in bed at night weighing up my options I really couldn’t see myself playing anywhere else over here. “The amount of support the club gave me through a tough time in my life, the love that I’ve got from the fans and the respect I’ve got from the playing group is something that if I’d walked away from it I know I wouldn’t have been happy with. Salford coach Ian Watson said: “Signing Jackson for the 2019 season is a great piece of business by the club and a great piece of business for Super League as a whole. “His energy and enthusiasm around the Club and the boys is infectious and you can see in the games he’s played how it lifts people around him. We have always had effort and commitment from our team but Jackson has lifted the pressure and allowed others to just play and enjoy the game. “Jackson wants to lead a team and be the dominant half and that fits perfectly within our team dynamics.